Our student residency is adjacent to the main building. All meals are provided by the college, but you can also access a shared kitchen where you can make meals or refreshments. Any dietary needs, such as food intolerances or allergies, can be discussed with the Catering Team. There are shared toilets, baths, shower rooms and laundry facilities on each floor of the Residency. Students with a particular medical condition may request an en-suite room, subject to medical evidence. Wi-Fi is available throughout the college. However, if you choose to bring your own television, you are responsible for a TV Licence. The main college building, which is open until midnight, has TVs, a pool table and table tennis facilities. Students often use the crypt, which was part of the old abbey, for social activities (especially Hallowe’en parties as the setting is ideal!). 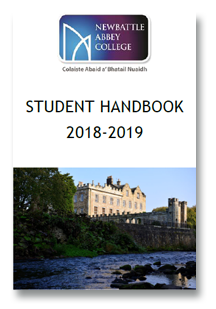 The Student Handbook for 2018 - 19 contains a wealth of information that all students will find helpful. From catering, to counselling, to transport, to much else besides - it's all here to help you navigate a successful path through your chosen course. Who can study at Newbattle? What's it like studying there? Can Newbattle change my life? To get the answers, watch this short video of real students telling it in their own words.